A fresh exterior for a contemporary classic. Nestled into fifty odd acres of beautiful Southern Illinois landscape, this home feels more like a retreat or sanctuary. Its owners and designers, a renowned Physician and his talented artist wife have created a haven in which they could recharge their batteries and entertain friends and family. From the oversized windows to the use of natural materials, through the harmony with the surrounding countryside this was a well thought out design. Finely constructed and beautifully maintained, this home is certainly a contemporary classic. The owners obviously take great care of this dwelling and it is hard to believe this home is over forty years old. Routine maintenance of your home’s exterior is important, not only for the curb appeal but for protecting your valuable investment. Repairing and painting areas before they become major problems reduces overall maintenance costs. 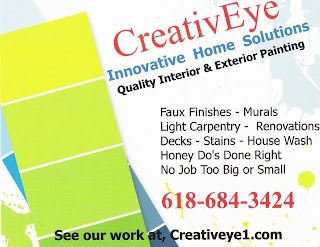 Previously CreativEye did small proactive repairs and painting on this home, solving issues that needed immediate attention, allowing the homeowners the space and time to assess their overall needs and budget for a full house paint. When it was time for a full paint, we were familiar with the home and able to offer a cost effective bid based on our knowledge and prior involvement. We approach every project with proper inspection; customized to address your individual home’s needs. Our goal with this project was to give a fresh, clean, long lasting professional finish. The only way to accomplish a quality finish is with a quality preparation. The exterior is wood, and had been painted with an opaque stain. For previously stained or painted surfaces in need of a solid color stain, a light house wash is necessary and will remove all dust, dirt, loose peeling paint and chalk deposits. This wash assures adhesion, prevents peeling, and improves the topcoat, helping achieve a smooth, blemish free, professional finish. Many do not know that paint bonds much better to a clean substrate. Moving around the home with the house wash, checking for surface irregularities (cracks, holes, rotten boards, window and door seal, caulk issues) we literally touch every inch of the surface as we prepare it and repair it. Most areas that required any scraping and priming were dealt with previously so this home was now ready for painting. Our choice of coatings was Sherwin-Williams Woodscapes, a premium exterior solid color stain that has excellent penetration on wood. It contains agents which inhibit the growth of mildew and is a great product especially for areas where landscaping and foliage is near the home. This residence has several levels, some large verticals walls, and many oversized windows to contend with. Positioning long ladders and scaffolding to reach everything in the soft-scape was a challenge, but with proper planning and safety awareness these were handled easily. I think there are some great lessons here for home owners. The most valuable asset most people own is their home. The best way to protect that investment is routine maintenance, a professional paint job, and taking care of things before they become big issues, all which save you money in the long run. The understanding that good preparation is the foundation of a quality paint job, one that looks great for many years and over time provides the most value. Simple maintenance, like a house wash, protects your investment and can add years to a home’s exterior life. Lets us help protect your investment. 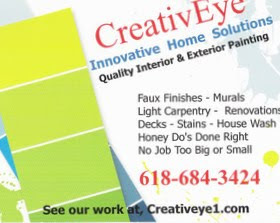 If you’re interested in our services and having us evaluate your needs, contact us through this site or call CreativEye at 618 684-3424. We would be happy to help with any of your maintenance needs.